As a parent, you learn pretty early on that children’s things can get pretty expensive. As fast as they grow, it seems crazy to pay some of the asking retail prices! But, when I was pregnant with my first child, I heard through the mommy grapevine about children’s consignment sales. After I went to my first one, I was hooked because of all the money it saved me. There are a few different ways to make these sales work well for you, so let’s dive right in. The first way to save some big money is by simply shopping at the children’s consignment sales as opposed to regular retailers. Every city and town is different, but here is a great website to check out and see which sales are near you and when they are happening. I know around here, we have two different sales and each of them come twice a year. That means that we get to hit up these sales four times a year! Each of them just happens to occur right around the change of a season. How convenient is that? Each of these sales have full price days and then usually one or two discount days at the end of the sale. Usually, the last day of the sale can be up to 75% off of the original asking price on the opening day of the sale. Most of the time there is still a lot left to pick through on these days, so going on the last day can really help stretch your money the furthest. These prices were all on the regular sale day. So if I had waited until the 75% off day, and they were still there, can you imagine how much more I would have saved? With this many items purchased, that equates to spending less than $2.00 an item. This is a HUGE savings! Since these sales have started selling pretty much everything, I also got a shirt for myself and a travel mug for my spouse. That was a nice surprise because I wasn’t even there to shop for us. Not only can you go shopping at children’s consignment sales and save a ton of money, but you can sell your old stuff there too. Obviously, this is where the inventory comes from for the sales to even happen. Of course, there are many other ways to get rid to successfully sell your old stuff. Why not consider consigning it, especially if you plan to shop the sale? When you sell your children’s old stuff, you get a portion of the asking price. Each sale is different, of course so you would have to check the rules for each individual sale to find out exactly how much you’ll get. A lot of the time though, it hovers around 50% – 60% that you get to keep. That may not sound like a lot, but it is still more than you get when you donate your items. The only real downfall to this aspect of consignment sales is that it takes time to find all of the things you want to sell and tag them accordingly. 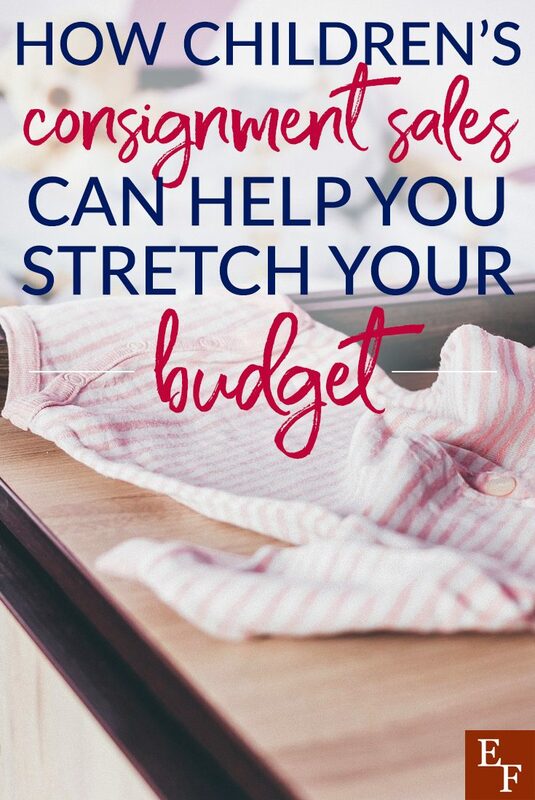 If you have enough things to sell, then you could potentially walk away from the consignment sale not only getting new things for your family, but also with money in your pocket. Now, that is what I call a win! One other way to maximize how much you can save at these consignment sales is to volunteer for at least one shift. Most of these sales run on volunteers to keep the operating costs low, which can put more in your pocket as a seller. If the operating costs are lower, then their cut of your sales will be lower. Therefore, the more volunteers they have, the more money you get from selling your items. On top of that, most sales give the volunteers an added benefit of being able to shop early before the sale opens to the public or having an earlier discount day for volunteers only. So if you volunteer, and are looking for very specific items for your family, being able to shop before the general public can gives you the best chance of finding exactly what you need. It also means that if you are willing to wait, and want to stretch your money the furthest, you get to shop at a discount before everybody else does. I don’t know about you, but I would have been even more excited to spend less than $1.00 an item for my haul than what I did spend. Even though I saved a TON of money to begin with. Overall, as parents, we are all trying to stretch our money as far as we can to get the most bang for our buck. Children’s clothes can get seriously overpriced and they can outgrow them so fast sometimes. Therefore, it makes sense to purchase lightly used clothes from a consignment sale instead. Not only can you save a ton of money by shopping at children’s consignment sales, but you can make money by selling your children’s old stuff and save even more by volunteering. There aren’t really any drawbacks to this, except that it takes a bit of your time. I love being able to make a little bit of money on my children’s old stuff, while also getting them new needed items for really low prices. Have you had any experience with children’s consignment sales? If so, how much money has it saved or made you? When is the Best Time to Look for New Appliances?